PEMF is pulsed electromagnetic frequencies. It is a therapeutic device that is widely used by all health fields. Pulsed electromagnetic frequencies penetrate the tissue and the sound causes a vibration within the tissue - “micro-massage”. Conditions treated by PEMF are sprains, edema, bursitis, sciatica, strains, arthritis, pulled muscles, pulled tendons, myalgia, sinusitis, scar tissue and neuralgia. 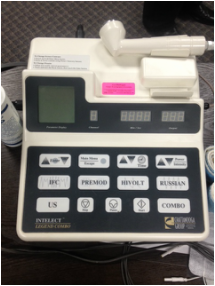 PEMF can also be used in combination with cold laser for added benefits.